Make traditional Indian Butter Chicken healthier and easier by lightening up a few of the ingredients and making it in your slow cooker. 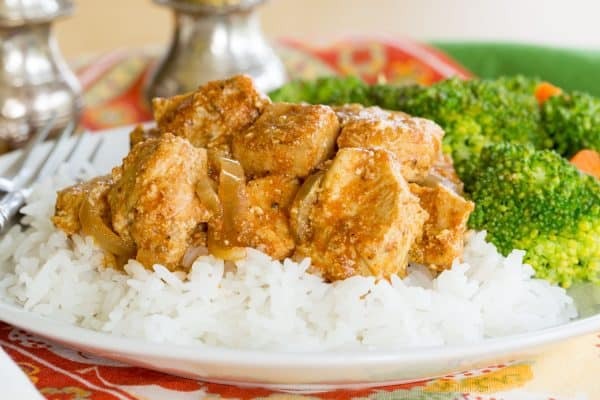 Slow cooker butter chicken with a healthier twist is a simple way to enjoy Indian-inspired cuisine right in your own kitchen. Come home from work and travel around the world for dinner when you make Lightened-Up Slow Cooker Indian Butter Chicken. Your kids will love this chicken too, so make this one of your back to school crock pot recipes! Disclosure: This post is sponsored, through a partnership with The Great Courses and originally published on April 18. 2017. As always, all opinions are my own. Note that this post was originally written two years ago. I remember one Saturday a year or so back, I was doing chores around the house. Then I realized I hadn’t heard any noise from my oldest son in quite a while. When you have two boys, any period of time with little or no noise is always suspicious. I looked around and found him in the basement, eyes glued to the TV. Cartoons? Nope. Kids shows? Not this time. Heck, it wasn’t even one of his favorite blockbusters. He was watching a documentary about this history of cancer research. Guys, he was six. And completely fascinated. It was one of those moments when you just don’t care about screen time limits. And it’s not uncommon to find him watching nature shows or history shows or DIY shows or, my personal favorite, cooking shows. He may love TV as much as any other kid, but he also loves to learn. This Indian butter chicken recipe is easy, bringing the flavors of India right into your kitchen. 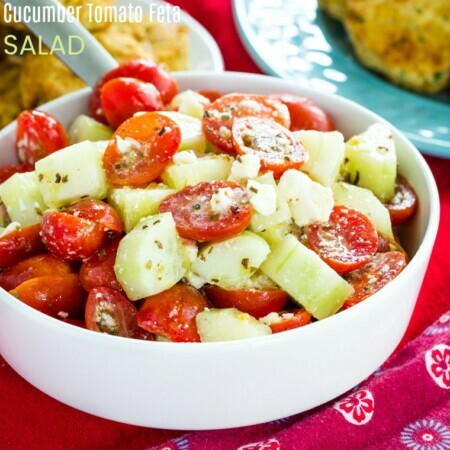 But by cutting down on the butter and swapping heavy cream for Greek yogurt, you still get all of the exotic flavors in a healthier dish. It’s as simple as adding a handful of simple, flavorful ingredients (think curry powder and garam masala) to your slow cooker. Then, let the aromas fill your home. 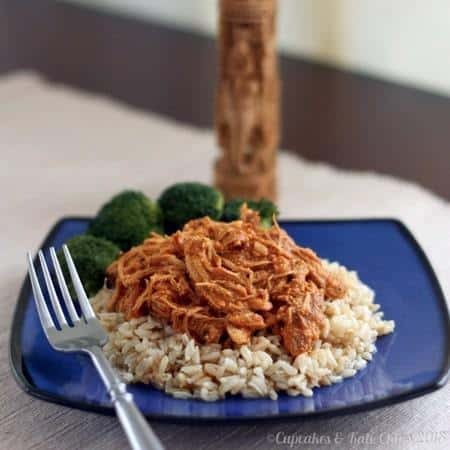 You can use whole boneless skinless chicken breasts if you would like a version of butter chicken that is shredded or pulled. Or cut your chicken into chunks if you prefer large pieces. Add the chicken to your crockpot with onion, garlic, butter, tomato paste, lemon juice, and spices. Then pour over a can of light coconut milk. You can use full-fat coconut milk for a more keto-friendly dish. If you are using the whole chicken breasts, at this point you will remove them from the slow cooker. Shred the chicken with two forks, then return it to the slow cooker. About 30 minutes before serving, ensure your slow cooker is on low, then stir in the Greek yogurt until it is nice and creamy. Right before serving, you will just need to cook some rice and steam some veggies. For a low carb dinner, swap traditional rice for some Browned Butter Cauliflower Rice. And of course, a piece of Indian naan bread is always a welcome addition to sop up that yummy sauce. Then finish the meal with Peach Mango Lassis. 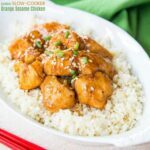 Is slow cooker butter chicken gluten free? 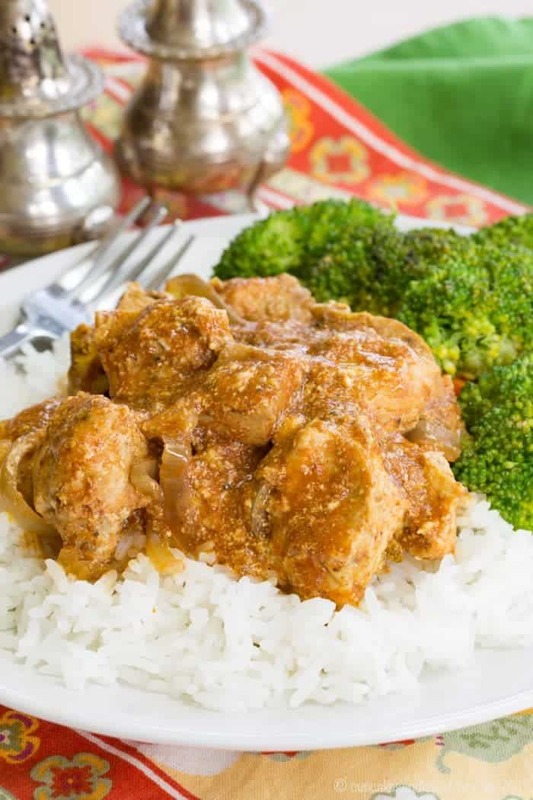 Yes, this butter chicken recipe IS gluten free! I always advise you to read labels, especially in the case of spice blends. This is just in case certain brands add fillers or manufacture where there could be cross contamination. But in general, this recipe does not use any gluten-containing ingredients. As we got ready to enjoy our Far East meal, we watched a few lessons on A History of India, just one of over seventy history courses available on The Great Courses. I knew a little about Hinduism and Gandhi and British colonialism, and I’ve heard of the Bhagavad Gita. But there are thirty-six lessons, so you can really dive into the full history of this fascinating country. But you can use some of the other lessons to inspire more meals. 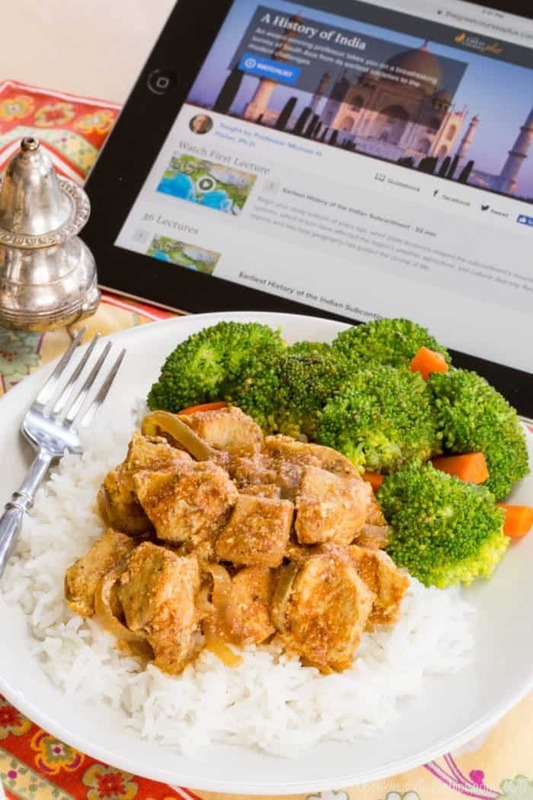 Or use meals to inspire you to learn more about the history and culture of other nations. Maybe you’ll watch The Guide to Essential Italy and want to make the World’s Best Lasagna, or learn about Genghis Khan in Barbarians of the Steppes and have some Slow Cooker Mongolian Beef Stew. Have some Pork Souvlaki as you explore Ancient Greek Civilization or dig into Shepherd’s Pie as you dig into The Irish Identity. You can learn more by following The Great Courses on Facebook, Twitter, and Pinterest, and preview some of the lessons on YouTube. 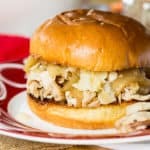 What other chicken recipes can I make in my slow cooker? My blogging friend, Becca, has a great recipe for Slow Cooker Italian Chicken, and check out Melissa’s recipe for Slow Cooker Chicken Pot Pie! 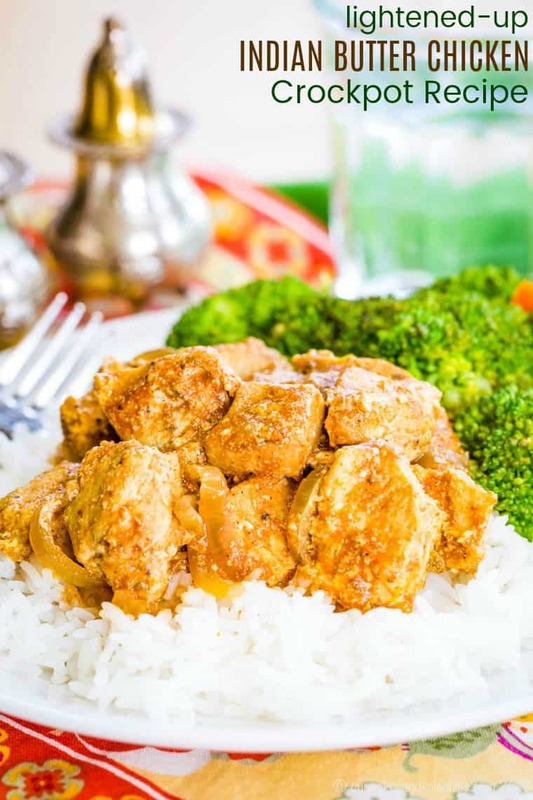 With the flavors of classic Indian butter chicken, but fewer calories and fat, this slow cooker recipe is sure to become a favorite! 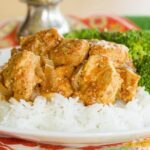 In the video, you’ll see how to make the version of crockpot butter chicken where you shred the chicken, so it’s almost like a slow cooker pulled chicken. 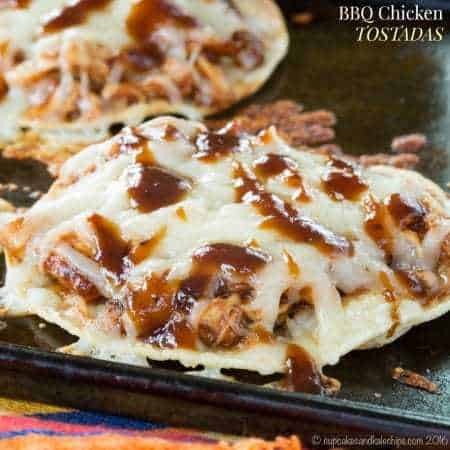 But if you want the larger pieces like in the photos, just cut the chicken into chunks before putting it in the slow cooker and don’t shred it before adding the Greek yogurt. Place the chicken, onion, garlic, and dry spices in the slow cooker. Add the butter, tomato paste, lemon juice and coconut milk. Cover and cook on low for 8 hours, or high for 4. If you are using whole chicken breasts, remove the chicken from the slow cooker and shred with a fork. Return the chicken to the slow cooker (if you used chinks, just leave them in the slow cooker). Stir in yogurt about 15 minutes before serving. Serve with brown rice, basmati rice, or jasmine rice. I also served it with steamed broccoli. This is a delicious and easy Indian recipe! Perfect with some naan bread. Thanks for sharing! Thank you so much… I hope you enjoy the butter chicken recipe! I still haven’t tried butter chicken, Brianne, but I just happen to have all the ingredients on hand today! This looks so good. Out comes the slow cooker! I’m so happy to have given you a new recipe to try, Jean. Butter chicken is delicious, and I hope you will enjoy it! Everything is already in a slow cooker. Can’t wait for the chicken to be ready. My only question is- there is no salt? Is it supposed to be like that? Will the chicken taste because of spices? There is a ton of flavor, but you can always season to taste if you feel it needs salt. Enjoy! Thanks for this great recipe! My family loves a good curry but it is a hassle to prepare for a weeknight meal. Until now! My daughter said this was way better than the curry I usually make and she is right! We love it!! Oh great! So glad you enjoyed it! What is Mango Lassis? My daughter, husband, and 8yr. old visit me every Friday for supper. I am a very amateur cook(mostly follow directions to the letter, no imagination or feel for cooking) -I think I may give this a try and see what they think. Mango Lassis are an Indian drink, basically a mango and yogurt smoothie. As you get more experience you will start experimenting more! Hi, this sounds wonderful and I love that it’s made in a Crockpot. I noticed in the “Meltaways” version they used 2 tsp of curry but you used 2 tbl of curry, is this correct? I can’t wait to make this, thanks for sharing! Oh my goodness, what a typo! So glad you caught it! Thanks! There is clearly not 2 T of curry missing from my container. I’ve heard people rave about butter chicken – love that this is a lighter version. Will try it out! Give it a try! I probably tried butter chicken years ago, and I am sure this is not quite so rich. You can throw it all together so quickly! Yes, you should make it! Brianne, this is some flavorful looking chicken. Yum! Brianne, this is amazing! I love Indian food and this is the first Indian recipe that I came across using butter, I can imagine how tasty it is. Thanks to both you and Pam for this fabulous recipe! It really is tasty! Give it a try! I LOVE INDIAN FOOD! I’ve always wanted to make butter chicken. I’ll give this a try! Thanks for reintroducing this recipe! I think this is a an easy intro to making Indian food. Fabulous post as always, Brianne. I want to make Pam’s dish too. I love Indian but can’t handle anything too spicy so this is perfect for me. I don’t have a slow cooker (so sad!) so maybe I’ll try this in my dutch oven – just set the heat on my stove real low and cook it long. And isn’t it amazing how the internet/smart phones can now stop debates right in their tracks? Before, we’d have to go to the library and do research in an encyclopedia (remember those?) to verify details & information! Thanks – you should try it! You can adjust to exactly how you’ll like it. Oh goodness, I do remember my bog ol’ World Book Encyclopedia. Luckily my mom eventually invested ina a set, so I could get some information pretty quickly. This always makes me think of my dad and grandpa, they adore this! I love how food can conjure up such strong memories! The flavors were wonderful. I know it is not the traditional preparation, but it still tastes good! Thank you, Brianne! A. My husband and my friends and I love curry. B. I’ve received a bottle of garam marsala from my ex-pat brother and his wife and wondering what the heck to do with it C. My husband loves chicken. You can be sure your recipe is a keeper! Oh good! Give it a try!! This is so doable. I remember eating dinner in front of the TV as a kid, but my mom, when she was single and we were on our own, used to let me do that as an occasionally treat. We were very close and talked a lot, but sometimes the two of us sitting at the table could get a little boring. I hope I can keep my boys at the table! I was always afraid to make Indian food. I guess I was afraid I would mess it up. I will have to make it soon. I was afraid, too, but it is hard to really mess up anything when you throw a bunch of flavorful ingredients into a crock pot. This is on my too make list also. I tried Sue’s lightened creamy (butter) chicken the other day and it was delicious. Can’t wait to try this one too! I’ll have to check out Sue’s recipe. She always has awesome things. Oh this looks absolutely amazing! I can just imagine how this melts in your mouth! Thank you so much for all your inspiration every week… there is nothing I love more than when you talk about all the wonderful food the bug enjoys! 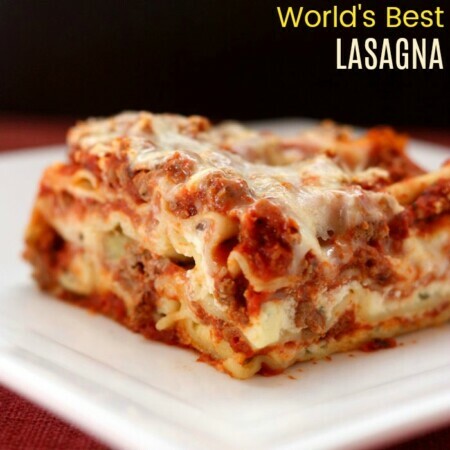 This recipe looks amazing and it is on my must try list for sure! No, thank you, Isabel. While we do eat together most nights, you and everyone else in this group inspires me to continue this as I look at your families through your blogs and see even the older kids still enjoying meals with their family. Plus all of the themes inspire me to come up with new ideas! And you must try this!! So goood! I’m also not a huge fan of Indian food. I want to like it, so I keep trying it. Maybe this is the dish that will turn me into a fan. Fingers crossed and trying your modified version soon! Give it a try! So easy that it won’t feel like a huge effort if you aren’t a fan. And maybe cut down on the spices the first time. The tomato and coconut and yogurt add a lovely creaminess, so you can add a little spice at a time till you get used to is. Butter chicken has been on my to-do list forever! I may as well go a bit healthier with it! YUM! A bit healthier, though still nice and creamy, and super easy. Yes, I am sure it is different (I know that it is more chunks of chickn versys shredded, but to be honest, I don’t know the differences in flavors), but regardless, the flavors are amazing. We absolutely LOVE Indian food in my house. 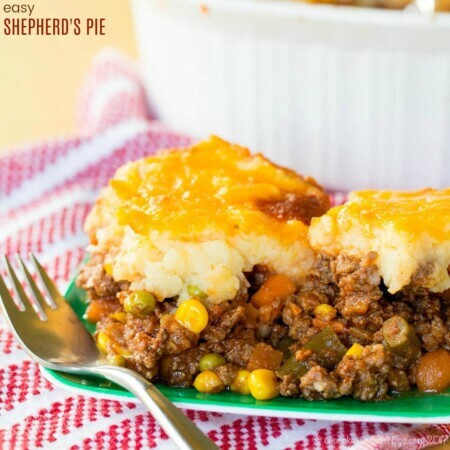 Even my super picky 7 year old is a fan, so I am all over this recipe! That is great he loves it! Hoping The Bug will if he tries it again. He was just in a mood that night. Love a good slowcooker recipe! I love this one! Nothing like having a delicious smelling, yummy meal waiting for you at the end of a day. Now I have butter chicken on the brain and have to make it. Looks so good!! This is an easy way to get your fix! My husband loves Indian food but he’s trying to lose some weight. I’m saving this to make when he’s craving some but needs it on the lighter side. This still has some richness with the butter and even light coconut milk, but it would be a nice treat that isn’t going too crazy. Like I mentioned, try using less butter even. You’ll still get all the spices, and I am not sure I tasted the butter much. The coconut milk and yogurt add a lot of creaminess and richness. It looks so amazing, and I love the flavors so much! Looking over the recipe I even have all the ingredients. About the cardamom, I might add some, since I use it a lot in baking and always have some. Happy Sunday Brianne! I should try some other recipes with cardamom, but couldn’t part with the $14. I’ll have to check an Asian market locally and see if it is cheaper. The flavors were really incredible! Nowadays I love Indian food, especially the goan cuisine. One of my favorite Punjab style dishes is the Butter Chicken. We are all nuts for this dish here and when we used to run a Tandoori restaurant here, we would have butter chicken very frequently with nans. You tempted me with your gorgeous butter chicken! I love Naan, and would be wonderful with this, but I have a slight wheat allergy, so went with the rice instead. Thanks! I want to make Indian food this year. I love it yet have not made it at home. I think this dish will have to be one of the first I make. This is certainly an easy way to start. And now with curry and garam masala in my pantry, I want to try more. This looks amazing! It’s plated so beautifully!! We love Indian food here even Morgan does, I have been shocked at how spicy she can eat her curry. But then again I guess kids in India eat it as well so I shouldn’t be so shocked. But I have to say I have never made butter chicken before, I love that it is a crock pot version as well. The Bug eats spicy Mexican, but I think this was just so new to him. I think he’ll like it next time, now that he has had a taste. Indian and Mexican have such different heat profiles so i dont blame him for not taking to it right away. I have been eaing spicy Indian food for as long as I can remember but it took me years to enjoy my Mexican food spicy. I am so glad that you liked it! We loved it and I’ll have to make it again soon for my hubs as well. Thank you so much for choosing one of my dishes – it totally made my day! Your pictures are beautiful – love the elephant! Thanks so much! It truly was wonderful, and now I am so happy I can give my hubby Indian food sometimes. ooh, didn’t know you had visited India. Wherabouts? I am from Bangalore, only came to the states about 15 yrs back. I cook Indian a lot at home, but have a light version of butter chicken too but have never tried it in a slow cooker. I bet it’s full of flavor cooked in a slow cooker. Have to try this recipe. Oh gosh, I was in a different place everyday, so I can’t even remember, it was such a whirlwhind. I was near Bangalore, and near Pondicherry, plus a couple of other places. 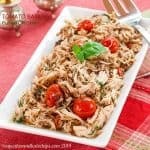 It is nice with the shredded chicken – lots of flavor in each bite!